Today is Sunday, June 20th. We left Kingman this morning after a stop at the "66 Swap Meet". Mostly alot of "junque" but Dad did pick up some shot shells for his .22 and .38, for a few bucks cheaper than back home. Talking with Dad, the guy selling the shot lived in a town 15 miles from my Dad in Florida. Small world. 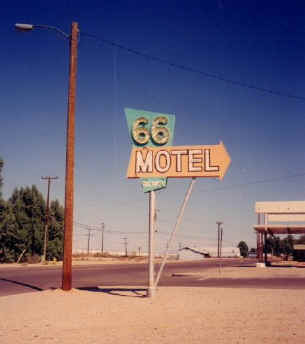 On the way out of Kingman, I look for "The 66" bar that was featured in the movie "Roadhouse 66." I turn left in the center of the old town, where they started the drag race in the movie. I noticed that this road is marked "Old Trails Highway." Just a block down, after making the left onto the road, is the old building used in the movie. Before leaving Kingman, we get that long overdue oil change at "Oil Can Harry's", located on Stockton Road. Great service and very professional. As we leave Kingman, what begins is what I think is the most picturesque part of the trip, the Road to Oatman. A stop off at Cool Springs Camp is first on the agenda. Look for the owners name etched in the cement from 1956. Behind the ruins is years of trash from the station days. We are truly filthy people sometimes. Throughout this trip, I have noticed old rusty tin cans everywhere. I guess those in the 20s 30s 40s and 50s just ate along the old road and tossed out the trash! TRAVEL TIP - Gas up in Kingman. More on that later. Our next stop was Shaffer's Fishbowl Spring. I had been anticipating this more than any part of the trip. Last year, while my wife Cindy and I were on our honeymoon, I climbed the steps to the spring, turned around and was amazed at the view. I took massive amounts of pictures this trip. If you have the time, stay at the spring for a short while. I was amazed at the amount of desert wildlife that has found this tiny water hole in the middle of nowhere. Moving on to Sitgreaves Pass, just below the parking area you'll see about a dozen handmade markers. My guess is that these are 66 travelers from days gone by who have had their ashes spread here after they passed away. Can't blame them, it is a million dollar view. Oatman mine is next, and you can't miss the heavy trucks, large buildings and barbed wire, which gives you a $2 view. Oatman was a treat. We hit it just in time to catch the daily gunfight in the middle of the street. We window shopped for a while and grabbed a bite at Cactus Joe's before heading to the Mojave. What did we get to eat? Rattlesnake! Really, bones and all. We got 5 sections of rattlesnake, all less than the size of a quarter, for $12. Probably a tablespoon of meat between all the sections. I guess than puts it in the "delicacy" class of food, as opposed to the "food" class of food. Crossing into California, we visited Needles. Almost deserted. The Old Trails Inn is closed, which is a shame. It looks like it was once a great place. We found that gas here varied greatly, close to two bucks off the Interstate, and almost 30 cents cheaper in town. Thru Goffs and Essex, I noticed that the outdoor temp is over 120. The water temp of the car is hotter than usual. Had to keep an eye on the gauge for a while. There is not much to see in the Mojave, other than the desert. The treats on this part of the trip are the old abandoned buildings. Lots at each town. You can't help but notice the rock graffitti that runs for MILES along 66. 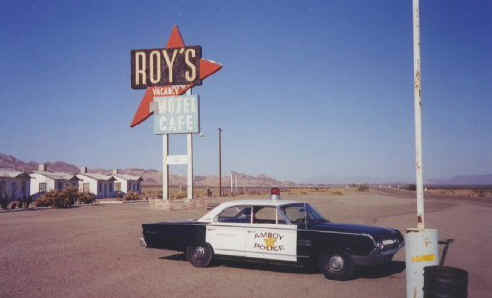 Into Amboy, we make a quick stop at Roy's. Actually, it's quite busy for being in the middle of nowhere, miles off the Interstate. We head west to Ludlow, where we meet Interstate 40. The end of our journey west. Our trek was over. Dwight Illinois to Ludlow California. Nine of the quickest days of my life. But stay tuned. We still have to get home.